350 Lb. 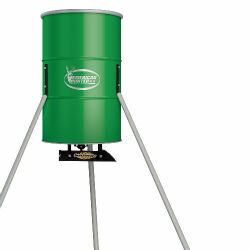 capacity Tripod Feeder with Sun Slinger Kit. Includes powder coated “No Blow” slinger and downspout . 6 Volt solar charger built in Adjustable feed rate (1-30 sec). Feeds 1-16 times per day. Can feed different days of the week. Easy touch digital timer Mounting brackets and self-tapping screws for ease of installation. Requires 6 Volt rechargeable battery (not included).